This level has medium difficulty. 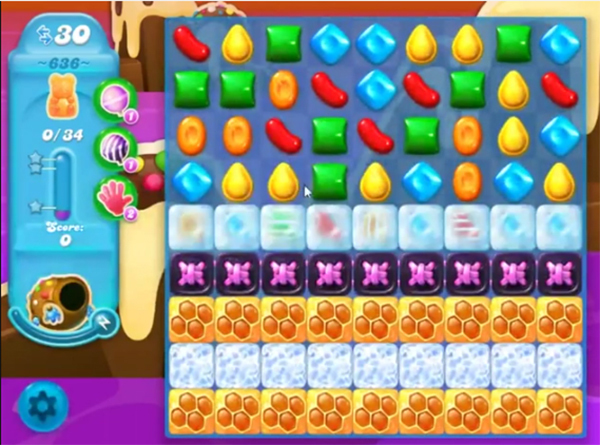 For this level try to play from bottom of the board and make special candy. Combine special candies with each other to break more honey and blockers. After play with remaining honey blocker to save the bears. I only have 27 moves. Have been stuck on this level for weeks. Using up all my earned bonus moves. About ready to give it up. I liove this game and will miss it. I only have 27 mover this level is ridiculous. I don’t even see a color bomb till the end. I’m about ready to uninstall appt. This is sad! I only have 27 moves not 30 this board is ridiculous! I will probably Uninstall this game and move on to a game that is not deceiving. This is sad cause I really like this game! I only have 27 moves NOT 30!! This is impossible to win !!!!! YOU NEED TO FIX THIS NOW!! This level is impossible. I am about to quit playing soda. Been on this level for a week. Who do you talk to to fix this? There’s 27 moves, not 30. My board doesn’t look like this. It takes several stripes, bombs etc to wipe out one row that you wipe out with one! I love this game but this level needs fixed! Can anyone explain how one can win this in 27 moves? Has anyone ever won this in 27 moves? Why do you give us the option to make comments when it’s obvious no one is paying atention to then? The same comment or rather concern has been stated for weeks about the fact there is only 27 moves and not 30. Don’t see any moves to fix it. I’d hate to have to uninstall also. I love this game. Same as all of above!!!! Will you please sort this FFS.!!!!!! Played this level for 2 months, but I installed now. I agree with you all, I think this level is designed in a way that you have to buy boosters! So its taken 2 weeks and all my boosters and I’m about to uninstall. This level is impossible! With all 27 lives there is no way it can be achieved. The lives are used up on the first level giving you no chance to start on second level. Ridiculous and what a shame to get to 636 then have to uninstall!!! What a sheer waste of time and effort. We should be given at least some hope in completing it but looks like the ‘powers that be’ don’t want us to complete this level!!!! I, like all the above only have 27 moves. Unable to complete the first board before I run out of moves. Just about ready to give up. I have been trying for weeks and am nowhere near completing it. It’s impossible. Has anyone any ideas? LOL, “medium” difficulty. It’s mathematically impossible to win this game in 30 moves without getting a miracle board. They want you to spend money. I have never spent a cent and will not. I didn’t ask for the game, it came with Windows 10 and I just tried it for the heck of it. I have a lot of bonuses but not wasting them on this. Never taken me longer than 3-4 days to win, so far, so will try a little longer but they have no reason to try to keep people who aren’t spending so may have to quit along with everyone else. It’s kind of fun but ridiculous that there is no support available anywhere. I have no clue what any of the things mean that appear on the board and in the game. But, again, what do they care? To everyone ready to give up, uninstall, cut their wrists, etc. I finally won it after 4 or 5 days of playing quite a bit. And I didn’t pay a penny and I’m not that good a player. I may have used up a few of my bonuses over that time but, oddly, not on the winning board. It’s mostly luck but you should get it eventually if you’re good enough to have played this many games. Just offering hope. I am super patient with games but I guess I’m running out of patience with this game. Impossible to solve with very few moves. If they won’t give extra moves I might give this a MISS.